Add this to history’s long list of misguided attention-grabbing moves: On Thursday, one-time vice presidential hopeful and long-time climate change denier Sarah Palin insulted beloved children’s television icon and climate change agitator Bill Nye the Science Guy. 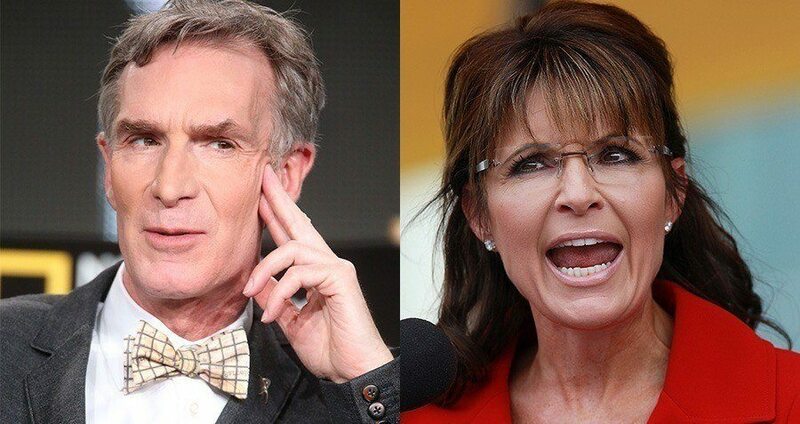 In an attempt to discredit the scientific evidence for climate change, Palin said that “Bill Nye is as much a scientist as I am. He’s a kids’ show actor. He’s not a scientist,” the Hill reported. And Palin didn’t stop there. While experts and popular figures like Neil Degrasse Tyson and Stephen Hawking have maintained that climate change is a fact, not a theory, Palin has stuck to her very confused guns. “The science is kind of getting thrown out of the window in discussions about changes in the weather,” she said. Palin made her comments at the premiere of Climate Hustle, a film suggesting that the government invented global warming. The film also made the far more dangerous claim that carbon emissions actually benefit the environment (they don’t). Other speakers at the event complained that they felt “peer pressured” to accept climate change as a reality, and warned of the imaginary “energy police” who might soon be invading your home to steal microwaves and television sets. Meanwhile, on the more rational end of the spectrum, Rep. David Jolly (R-FL) recently urged fellow Republicans to accept the science behind climate change, and next week at the United Nations, leaders from across the globe will sign a symbolic agreement to cut down on pollution. Oh, and by the way, Bill Nye holds a degree in mechanical engineering from Cornell University, and helped design a sundial used in the Mars Exploration Rover missions. Next, check out some of the most inspirational and educational Bill Nye quotes.